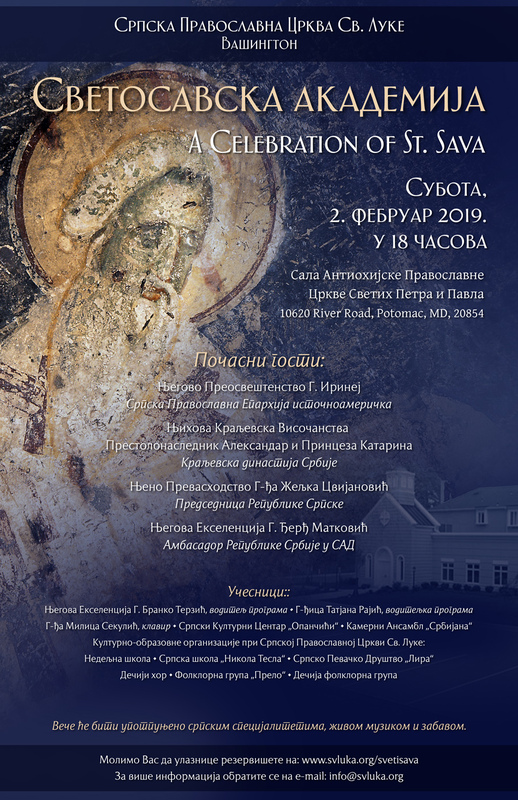 Serbian Orthodox Diocese of Eastern America - Join us for a Spectacular Celebration in Washington, D.C.! Join us for a Spectacular Celebration in D.C.! The St. Luke Serbian Orthodox Church of Washington, D.C. cordially invites you to join us for an evening of celebration in commemoration of St. Sava on Saturday, February 2, 2019 at 6:00 p.m.
Honored guests include His Grace Bishop Irinej of Eastern America, Their Royal Highnesses Prince Aleksandar and Princess Katherine of Serbia, Her Excellency Zeljka Cvijanovic – President of the Republic of Srpska, and His Excellency Djerdj Matkovic – Ambassador of the Republic of Serbia to the USA. In addition to invigorating remarks by our honored guests, the Cultural and Educational organizations of the St. Luke Serbian Orthodox Church will be performing various selections, in addition to the Serbiana Chamber Ensemble and Opancici Serbian Cultural Center of the greater Washington D.C. area. This spectacular event is not one to miss. To purchase your tickets, please visit our website here. For more information, please contact info@svluka.org.